A long, narrow parallelogram of woven (not stretchy) fabric. Ends may be blunt (making it a long rectangle) or tapered. Used by wrapping around wearer and baby and usually secured with a double knot. Dozens of different ways to wrap depending on personal preference, baby's age and wrap length. Incredibly versatile. Good for all ages newborn and up. No upper weight limit. No need to "upgrade" to bigger carriers for toddlers or preschoolers. Nearly all size wraps usable by nearly all size wearers. Good for front, back, hip or even forward facing. 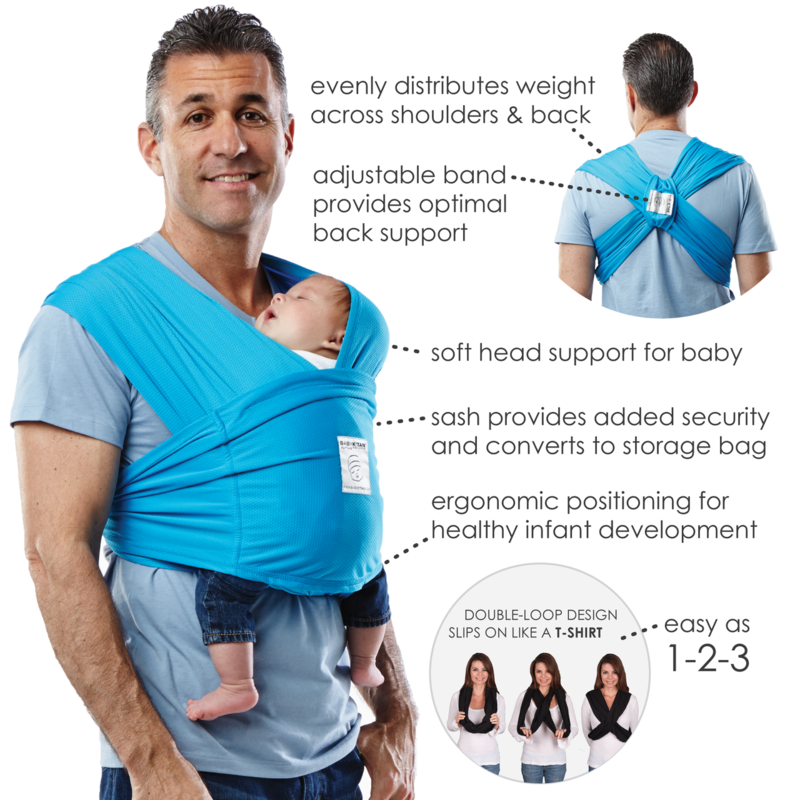 One of the few carriers that (with experience and care) can be safely used to back carry a newborn. Steep learning curve. Takes more time to get baby up. DIY/"Simple Piece of Cloth" - A woven wrap made from bolt fabric such as osnaburg or cotton duck or repurposed fabric like a tablecloth. Inoshi: A commercial wrap with a built-in tie waistbelt to make the seat unpoppable. Walter's Never Fail Wrap : A commerical wrap with built in leg holes to make the seat unpoppable. 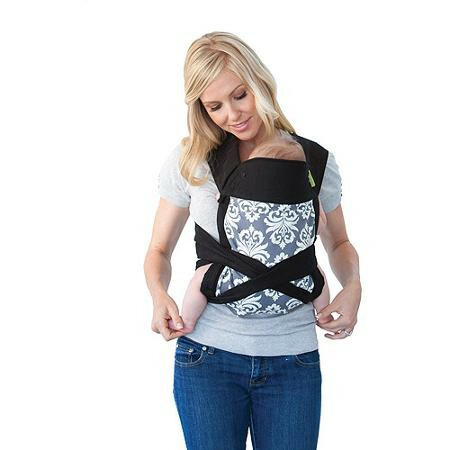 XOXO Carrier: A commercial carrier which is essentially two narrow cross passes of a wrap attached to a buckle waist band to make the seat unpoppable. A long, narrow parallelogram of stretchy fabric; usually similar to a jersey knit. Front Carries: Good from newborn and up with 3 reinforcing passes. Rated up to 35lbs, usually starts to get uncomfortable around 15lbs. Hip Carries: Good for babies with strong truck control with 3 reinforcing passes. Rated up to 35lbs, usually starts to get uncomfortable around 15lbs. Poppable and can be pre-tied (tie it once and then pop baby in and out as needed for diaper changes or to nurse.) One-size-fits-most. 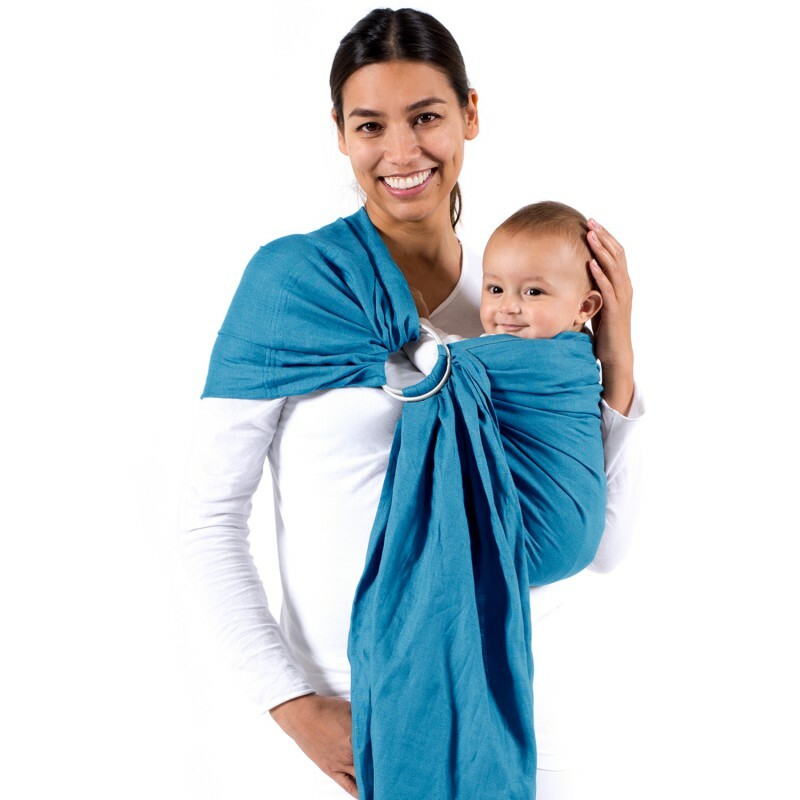 Good for tandeming with a larger child on your back since you can pre-tie the stretchy wrap, put larger child on your back, and then pop baby into the stretchy wrap without having to readjust. Tricky to learn how tight to pre-tie. Often only comfortable for the first few months of baby's life before baby is too heavy and it constantly sags (most moms stop liking them around 15lbs.) Must have three passes supporting baby, which means that they can be hot in summer. No way to safely back carry. 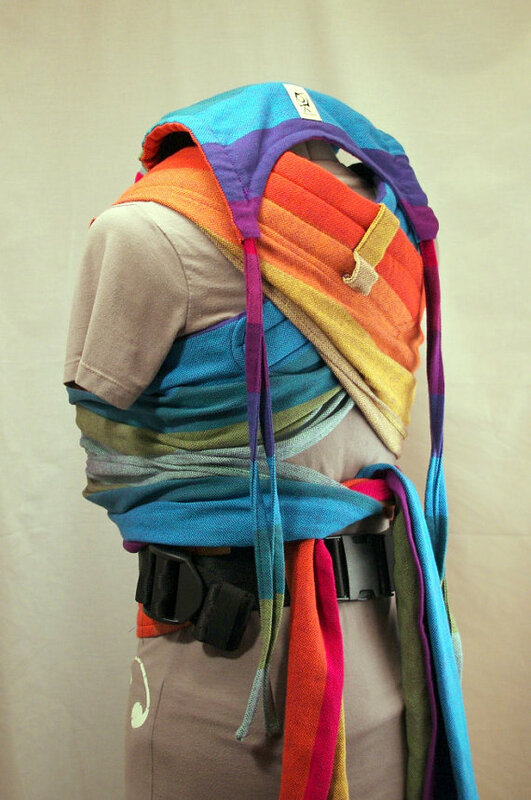 "K'tan" or Huggaloops dual pouch carrier: instead of one long, continuous strip wrapped around three different times, it is instead two closed loops (each crossing the body diagonally) and one waist sash. Easier to put on, but must be carefully sized for the wearer. Regular stretchy wraps are nearly one-size-fits-all. Some companies like Moby do offer plus-sized lengths. Smaller wearers would simply wrap the extra tails around their waist an extra time before tying of. K'tan-style loop carriers must be very carefully sized to the wearer as they have no way to adjust. 2-3 meters of woven (non-stretchy) fabric with two aluminum or nylon sling rings sewn onto one of the short ends. The fabric folded through the rings may be simply bunched (gathered), folded into neat pleats, or any combination of the two. Fairly easy to learn to use. Incredibly quick to put baby up or take them down. Easy to adjust one-handed. Incredibly newborn-friendly, but also good for toddlers who want up and down frequently. Easy to nurse in. Affordable. 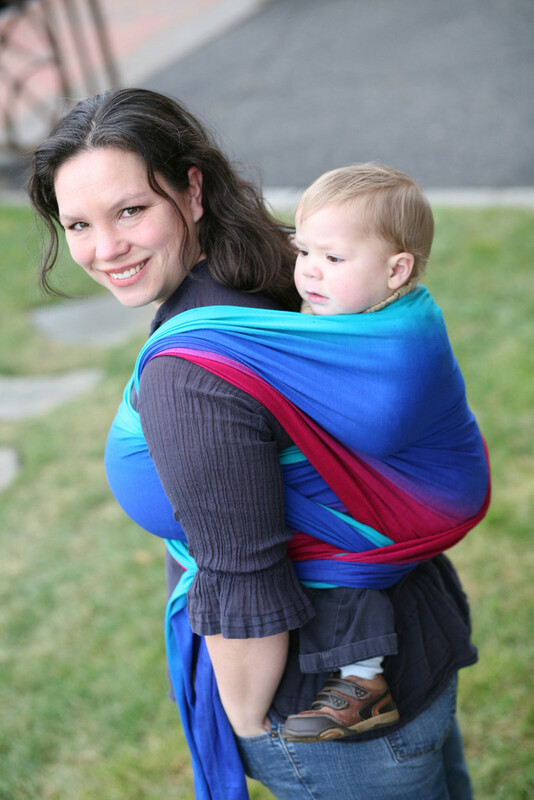 Easy to tandem two small babies on your front with two slings on opposite shoulders. Incredibly flexible sizing. One-shoulder carries can be less comfortable for larger babies or longer wearing. Not recommended for back carries. Not good for "seat poppers" or babies who tend to straighten their legs when worn. Pleated shoulder: the fabric sewn around the rings is first pleated to make the fabric narrower and neater and then sewn a few inches from the rings. Lays more neatly on the shoulder without getting bunched. Pleats may go straight across, be pleated from the center, box pleated, or any other combination. Gathered shoulder: the fabric sewn around the rings is simply bunched through the rings and then sewn straight across a few inches from the rings. Allows more "spread" to the fabric across the shoulder and therefore better weight distribution. Floating gathered shoulder: Same as gathered, except more fabric is pulled through so the stitching is 12"-16" away from the rings and sits behind the shoulder when worn. Allows for a double layer of fabric across the shoulder and the most spread. Hybrid/Eesti: any combination of the above; typically a few pleats along the outside of a gathered shoulder. 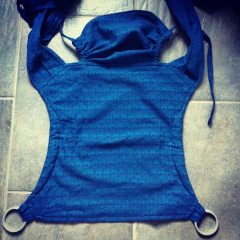 Padded shoulder: padding is sewing into the shoulder and top rail of the sling for cushion. Closed-tail ring slings: the tail is a narrow strip that only allows you to loosen and tighten the sling as a whole; does not allow for strand by strand tightening of specific sections of the sling. Sizing simply effects the length of the sling, and therefore how much tail hangs through the rings after it is tightened. 12" of tail minimum is safe, and you want the tail at least 12" above the ground to avoid being a tripping hazard. That said, sizing is incredibly flexible. 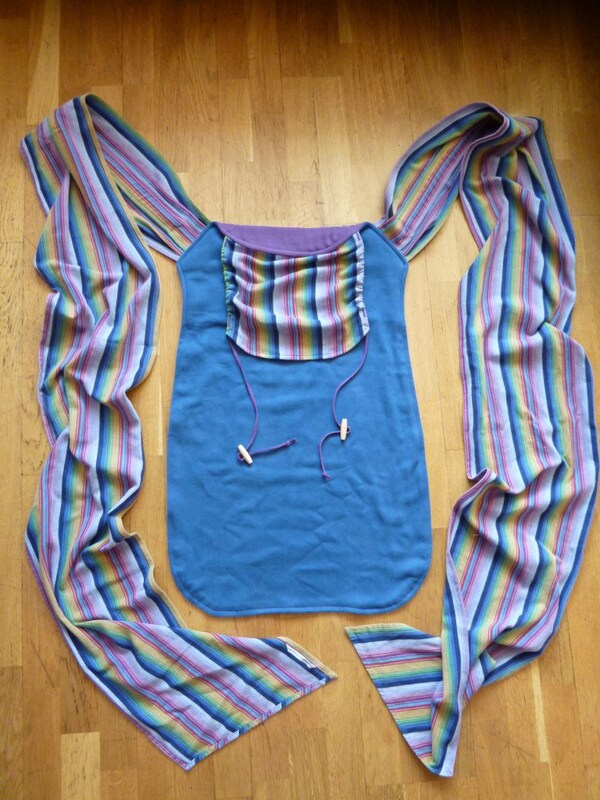 A 5'7", US size 10 woman can wear anywhere from an XXSmall to and XXLarge ring sling safely. Some brands such as HotSlings do offer some minimal adjustment ability. Narrow Based Carriers (NBCs) like BabyBjorn: has a narrower base that does not support baby's legs in an ergonomic "M" position. Not a safety risk for healthy babies, but may possibly exacerbate problems in babies predisposed to hip displasia. A rectangular body panel with two long shoulder straps coming out of the top corners diagonally and two shorter waist straps coming out of the bottom corners horizontally. 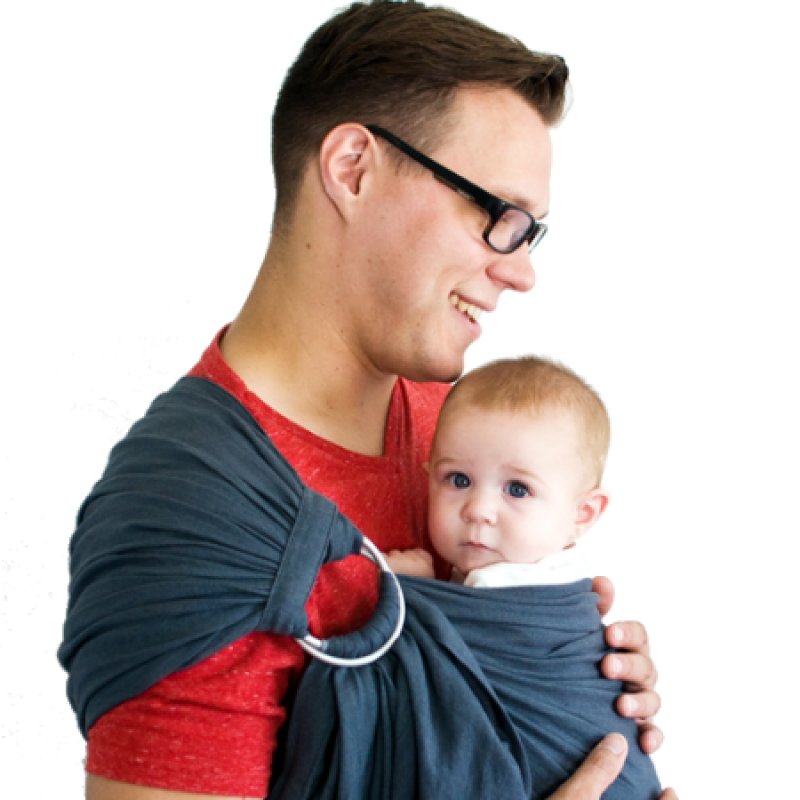 The carrier is tied around the waist hanging down, "wrong-side" out like an apron, and then pulled up over baby. The shoulder straps go over the shoulders, under the arms, and either tie under baby's bum or cross over baby, under baby's legs and then tie. Forward Facing: Good for babies with strong head control and decent truck control; usually requires the carrier to be modified/cinched narrower. Incredibly easy to learn to use. Flexible sizing can fit multiple parents. Offers wrap-like support with the ease of a buckle carrier. Ability (with experience and care to monitor breathing) to back carry newborns safely. 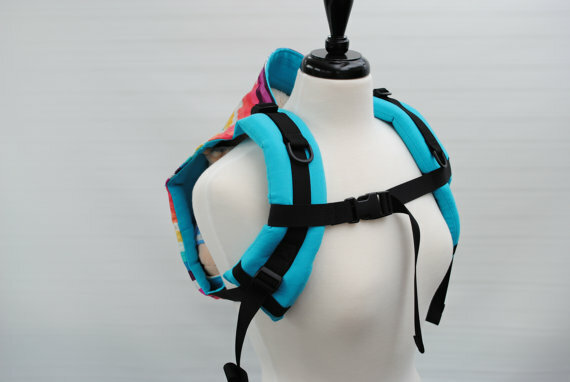 Waist-strap and two shoulder straps offer good weight distribution for long wearing. 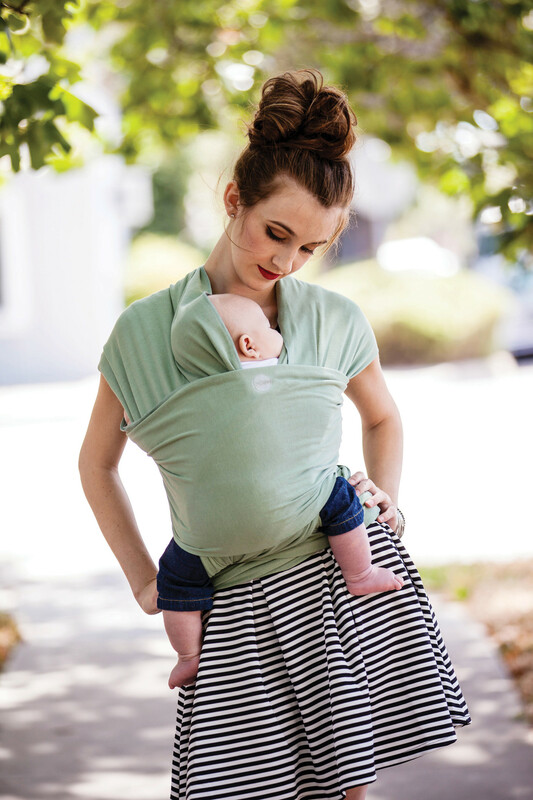 Easy to adjust panel size (by rolling the waistband or cinching the bottom) to fit a newborn. Wrap strap: Straps are wide (10"-15") and flat like a woven wrap. Padded straps: Section of the shoulder straps closest to the body panel include padding, usually either fleece or open cell foam. Half-buckle: Waist straps include a buckle closure instead of a tie closure. Ring-waist: One waist strap is replaced by double sling rings, which the other waist strap is threaded through like a D-ring belt. Body panel size is based on child's size. Body panel should be tall enough to reach at least up to baby's armpits but not so tall that baby's airway is obstructed. (The waist band can be "rolled" an extra time to shorten a too-tall panel.) The width should be wide enough to support baby's legs from knee-pit to knee-pit, while still allowing the legs to swing freely at the knee. (The body panel can be cinched with a ribbon or hair tie to make it narrower for smaller babies.) The strap length is determined by the wearer's size. Most mei tai strap lengths are considered one-size-fits-most. Front Carries: Not designed for front carries. Possible with long enough straps to cross in the back, add support with reinforcing passes and close off the open sides. Quick to put on and an unpoppable seat makes it easier to wear wiggly or difficult toddlers who may not have the patience for wrapping. Lack of waist belt is great for anybody who doesn't want the pressure on their waist, including (but not limited to) expectant mothers. 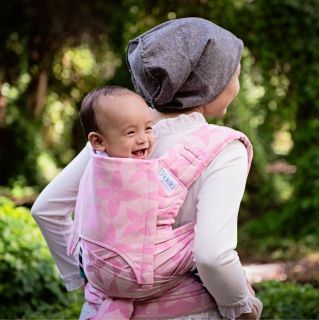 More limited than other carriers, since onbuhimos are really best for older, independently sitting babies and only designed for back carries. Panel size is dependent on child's size. 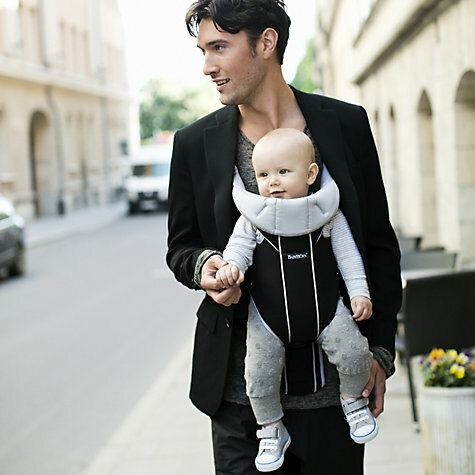 Therefore a parent who chooses to wear as their baby reaches toddlerhood or preschooler age may need to upgrade to a toddler-size or preschool-size carrier. Ring loops: a small sling ring is attached with a small fabric loop at each of the bottom corners. X-onbuhimo or Blanketless Onbuhimo: Functions the same as a traditional onbuhimo, but instead of separate straps and body panel, it is constructed in an "X" shape with two narrow slings. Body panel size is based on child's size. Baby needs to be able to fit in the carrier arms-out, but the panel must not be so low that baby can lean backwards. The width should be wide enough to support baby's legs from knee-pit to knee-pit, while still allowing the legs to swing freely at the knee. The strap length is determined by the wearer's size. A rectangular body panel with two shorter shoulder straps coming out of the top corners diagonally (usually padded) with double sling rings on each, and two long wrap straps coming out of the bottom corners horizontally. The bottom straps are pre-threaded through the double sling rings on the shoulder straps like one would a ring sling. Baby is put on to the wearer's back high with arms out, and the tails of the straps are pulled to tighten the shoulder straps. Tying off is optional (since the double sling rings lock the straps in place) but longer straps allows for reverse reinforcing passes for more support and/or a tibetan tie-off. Reverse X-onbuhimo or Reverse Blanketless Onbuhimo: Functions the same as a regular reverse onbuhimo, but instead of separate straps and body panel, it is constructed in an "X" shape with two narrow slings. A rectangular body panel with padded backpack-like straps and webbing attaching each top corner to the bottom corner on the same side. A chest clip attaches the two shoulder straps together. Front Carries: Not designed for front carries. Possible with babies with decent trunk control if the carrier allows the straps to cross in the back. Ladder lock straps: Instead of buckling closed, a buckle onbuhimo with ladder lock closure is permanently "closed" and simply tightens or loosens with ladder locks like a back pack. Body panel size is based on child's size. Baby needs to be able to fit in the carrier arms-out, but the panel must not be so low that baby can lean backwards. The width should be wide enough to support baby's legs from knee-pit to knee-pit, while still allowing the legs to swing freely at the knee. The shoulder strap lengths are flexible, but determined by wearer's size. A wide rectangular "blanket" is attached to a long, continous strap coming out horizontally from the top corners of the "blanket." 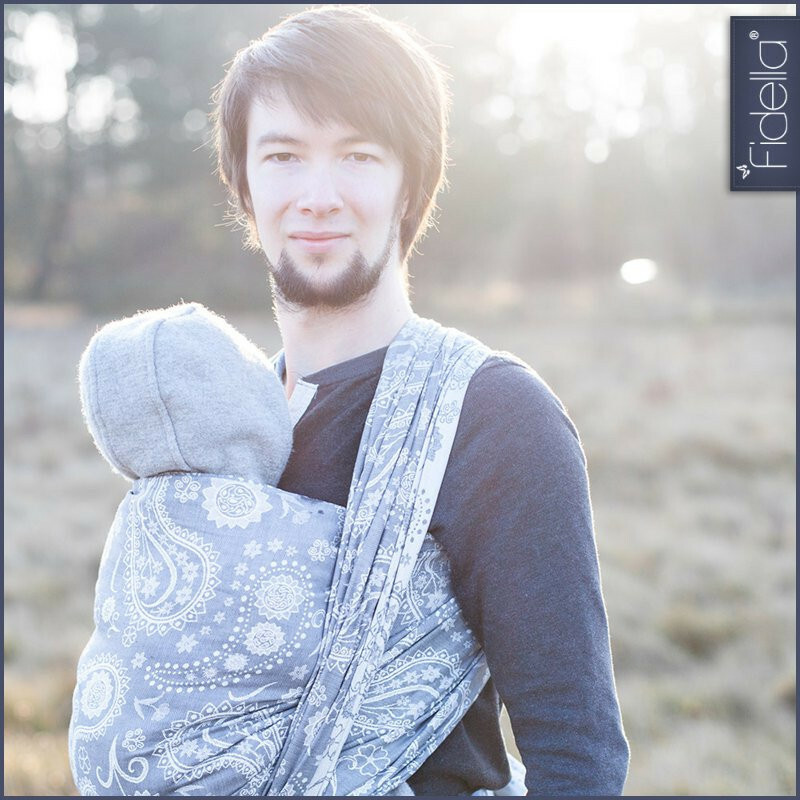 The blanket wraps around both the wearer and the wearee and the straps then cross under baby's bum to secure them. Simple, traditional construction. Less "material" to deal with than a meh dai or a woven wrap. Less common carrier makes documentation on usage harder to find. Safety standards have not been created for podaegis, so no commercial podaegis exist that pass current carrier safety testing. 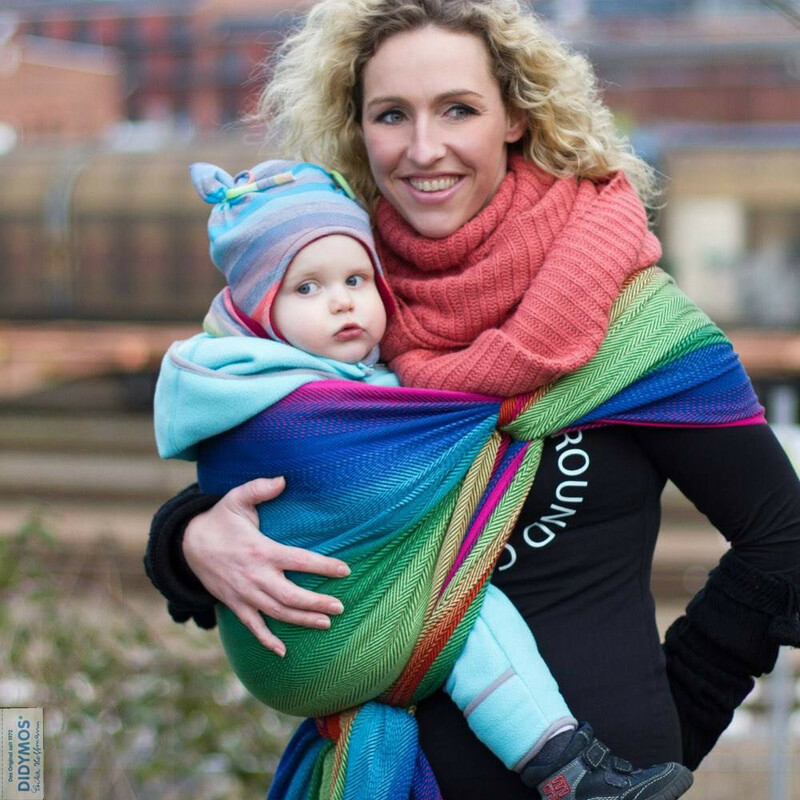 Traditional/Wide-blanket: the "blanket" is wide enough to wrap around both baby and wearer. Baby is wrapped with straps going over both legs and under their bum with legs inside the blanket. Blanket is sometimes quilted. 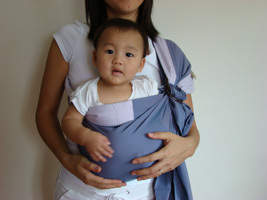 Narrow-blanket: the "blanket" is sized more similarly to a mei tai, allowing baby to be worn with a more wrap-like reinforcement with legs out and each reinforcing strap going over the first leg and under the second. Modeled after the traditional Hmong Nyia. The term "narrow blanket podaegi," due to its inaccuracy, has fallen out of favor, and it is preferred to use the more accurate term "Nyia." One size fits most. Total combined strap length should be somewhere between the wearer's "base size" wrap (the length needed in a wrap to do front wrap cross carry) and a base-2, so plus size wearers may occasionally need slightly longer straps. Simple, traditional construction. Less "material" to deal with than a meh dai or a woven wrap. Size is nearly universal for all wearers and wearees. Straight straps: Top straps are horizontal and sometimes one continuous strap going through the top of the blanket.